We have to call a spade a spade: The upcoming generation won’t do phone calls anymore. To message friends and family with WhatsApp, Messenger and co is by now the most popular communication channel. Companies should think about instant messaging for businesses, because according to the Facebook-commissioned study by Nielsen, 56% of people surveyed would rather message a business than call customer service. 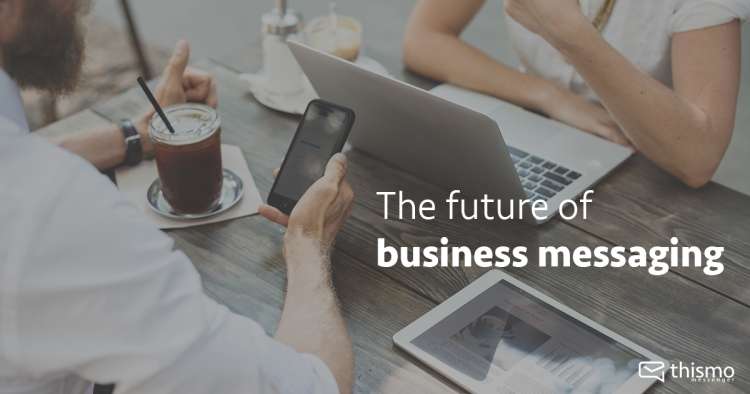 Business text messaging will become the norm since 67% expect to message businesses even more over the next two years. WhatsApp already plays a big role for businesses, even more since WhatsApp is testing WhatsApp accounts for businesses in a pilot program. But customers use more than just one messenger most of the time. There is also Facebook, Messenger and many more. For businesses, it is important to be where the customers are to reach every customer the same way. But up to now companies take on average 10 hours to respond to private messages in Facebook Messenger. Without chatbots the upcoming requests can’t be mastered. But there is one more thing that will ease the whole communication: Our all in one messenger for desktop. We build the thismo messenger business gateway to respond to all requests coming from WhatsApp, Facebook, Messenger, Web Chat and so on via one central platform. What means that your customer service has every request, from any messaging service at a glance. So, messaging is already an important topic when it comes to communicating with customers. Businesses have to initiate the change of the way they get in touch with their clients. Especially company’s opinion that messaging is irrelevant for their business case is not the best approach. Companies have to keep the pace with technology to a new form of communication. Thinking about a remarketing campaign with messaging?